Poached to Perfection – Two Kinds of Eggs Benny at Futures Bakery! 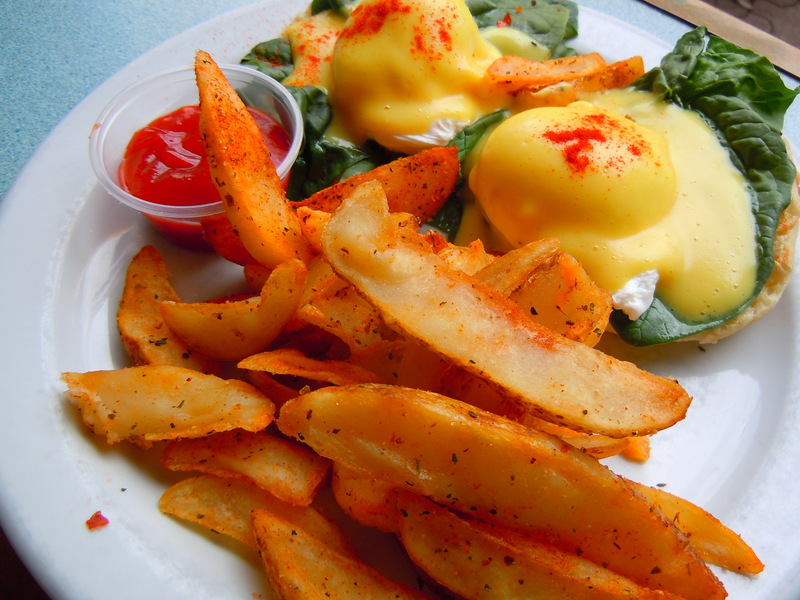 When I was growing up, I was fascinated with all the different ways eggs could be cooked and served. This might sound all sorts of nutty, but when I used to accompany my mum to the supermarket when I was little I would grab all the little egg recipe books (you know, the ones by Get Crackin’) and all the coupons around the store not for their discounts, but for the recipes on the back and for the pretty pictures of egg sandwiches, omelettes, and frittatas on the front. And till this day, those tiny recipe flipbooks are sitting comfortably in a file folder reminding me of the days when I dreamed of cooking great meals all on my own. As weird as it sounds, eggs play a role in a lot of my foodie memories, both sentimental and otherwise. My grandmother made – and still makes – the best Chinese style preserved egg, something I really enjoy eating but also something I eat as sparingly as possible because of its salt content. My little brother and I would test our “cooking” skills on Mother’s Day when we would “surprise” our mum with scrambled eggs a la breakfast in bed. And the runny style eggs used in dishes like Chinese shrimp and egg rice remain my favourite along with the classic overeasy. One thing that always left me stymied growing up though was figuring out what a poached egg was, and how to make one! Up until I started university, I had no idea what a poached egg was and I had no idea that it was the center of attention when it came to the ever popular brunch dish, eggs benedict. All of that changed though when I ate my first eggs benny a number of years ago and found out how to cook a poached egg. I thought to myself, “I get to create a whirlpool of hot water in a pot to cook an egg?! How funky!” And so began my journey into the world of hollandaise sauce, eggs benny, and all its different variations: smoked salmon, peameal, ham, spinach, you name it. 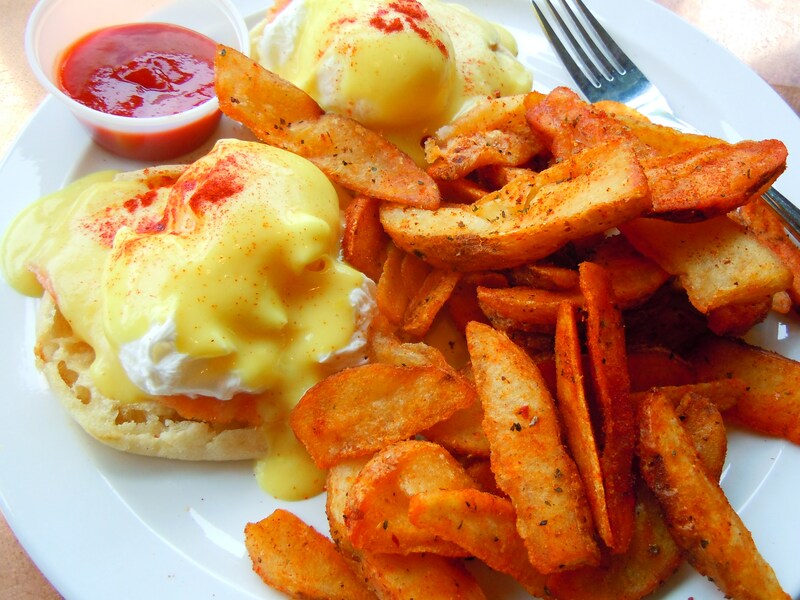 Futures Bakery offers 3 different kinds of eggs benedict including eggs benny with grilled ham ($6.95), eggs florentine with fresh spinach ($6.95), and eggs blackstone with smoked salmon ($7.95). 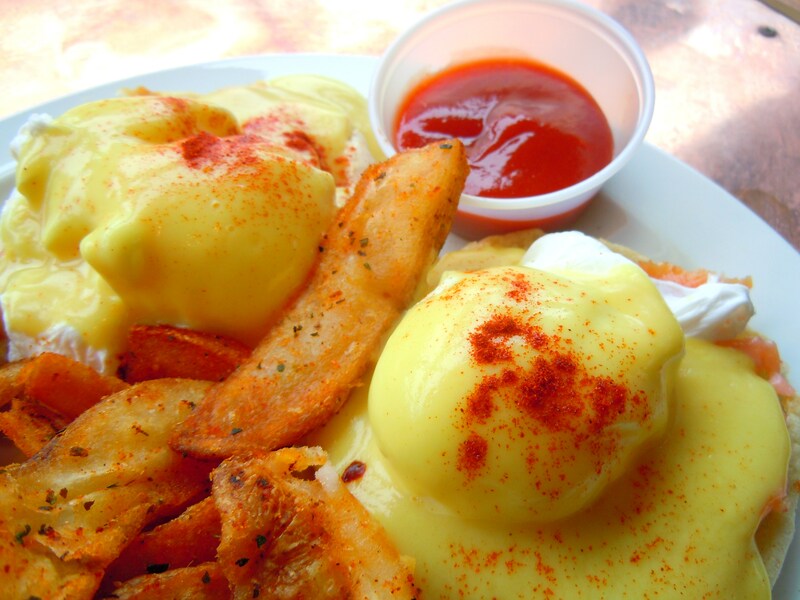 I’ve tried both the eggs blackstone and eggs florentine and eating these two amazing breakfast dishes makes me realize what was wrong with past eggs benedict dishes that missed the mark. For one thing, the English muffin is soft and moist. I’ve had eggs benny on English muffins that were dry and let me tell you, it’s not fun. It is also not a walk in the park when you need to saw through an English muffin that crunches like broken glass. 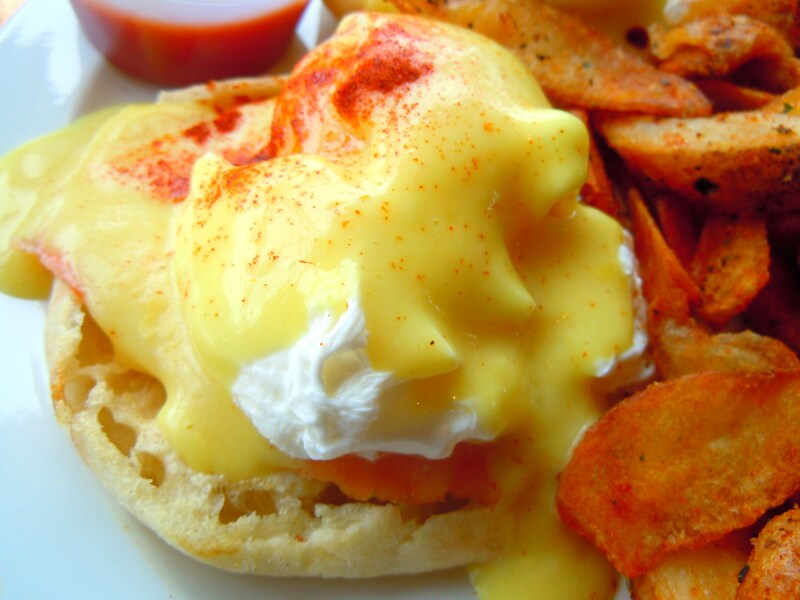 With eggs benedict, the English muffin is supposed to mesh with the poached egg and whatever it’s being served with so that you can cut into it with one swift motion. 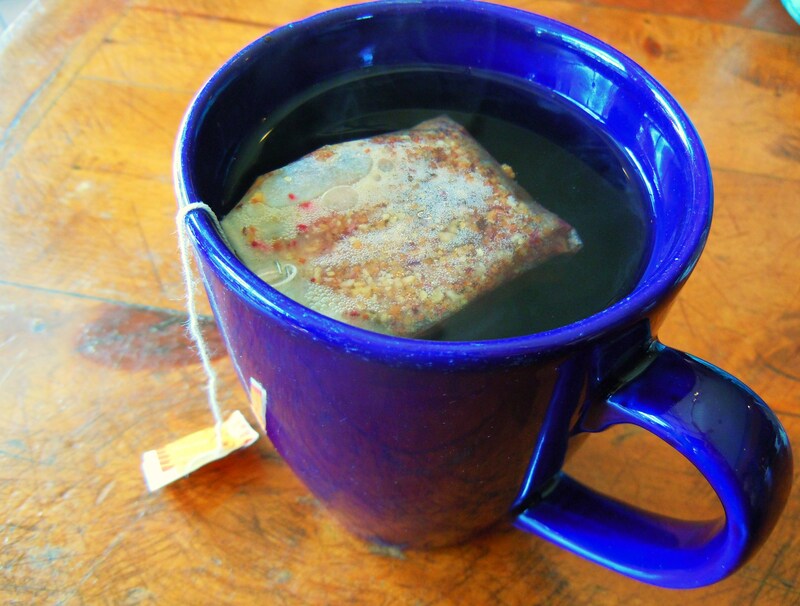 It’s meant to be creamy and pillow soft, not starchy or anything that would remotely leave you feeling parched. Futures does SUCH a bang on job with both of these. The eggs are poached to perfection. 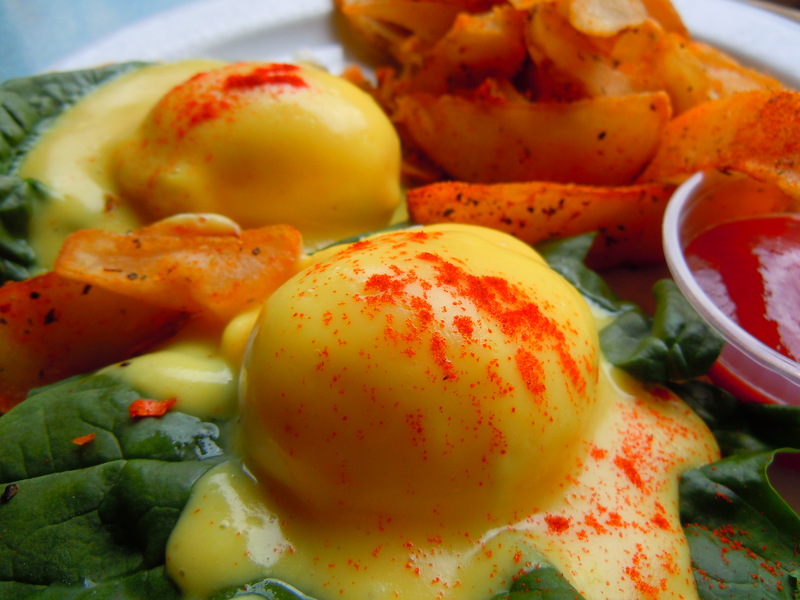 None of the yolk threatens to spill out before you even take a poke at it, and the hollandaise sauce is delicious. It has the perfect consistency (not so thick it goops up but not thin and runny either) and they’re sprinkled with the yummy all-dressed chip-like spice mix which is also what coats their scrumptious potato home fries on the side. 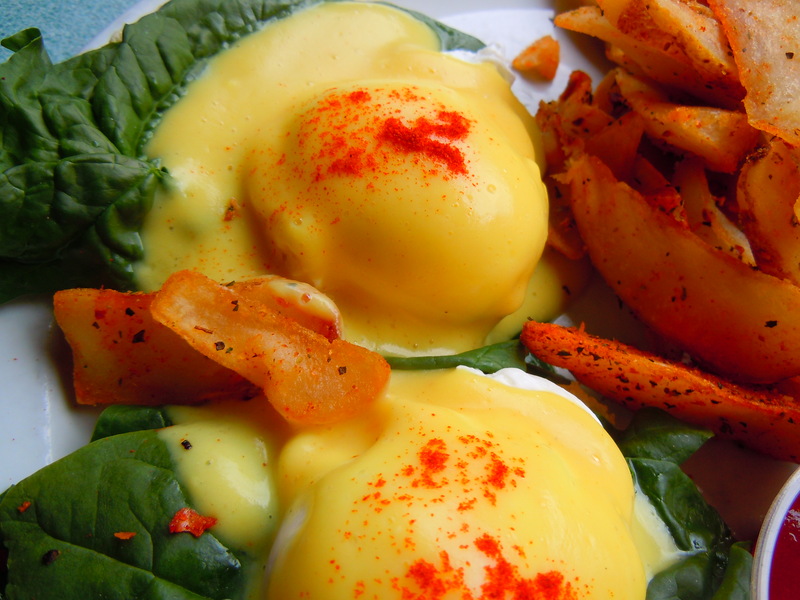 The spinach leaves are HUGE on the eggs florentine and the smoked salmon has that wonderful slightly salty flavour to it that makes the whole dish explode with savouriness when you combine it with hollandaise and home fries. Two eggs benny dishes for brunch, poached to perfection. Futures Bakery and Cafe is located at 483 Bloor St. West, in between the main intersections and subway stations of Spadina Ave. and Bathurst St. It sits right at the corner of Bloor St. and Brunswick Ave. on the south side of Bloor. They are open from 7:30am to 2am 7 days a week. 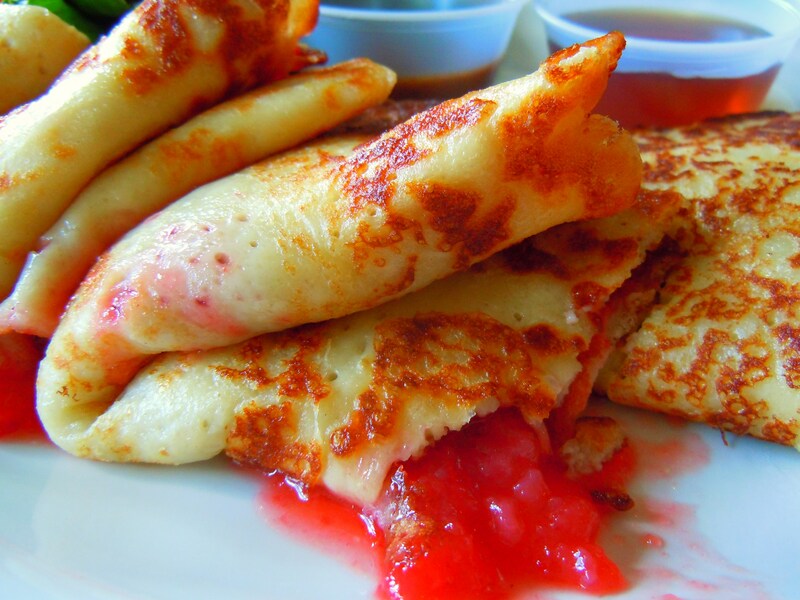 That morning swim worked up quite the appetite, so to celebrate all yummy breakfast things, I have fresh and fruity strawberry crepes from Futures Bakery for you! 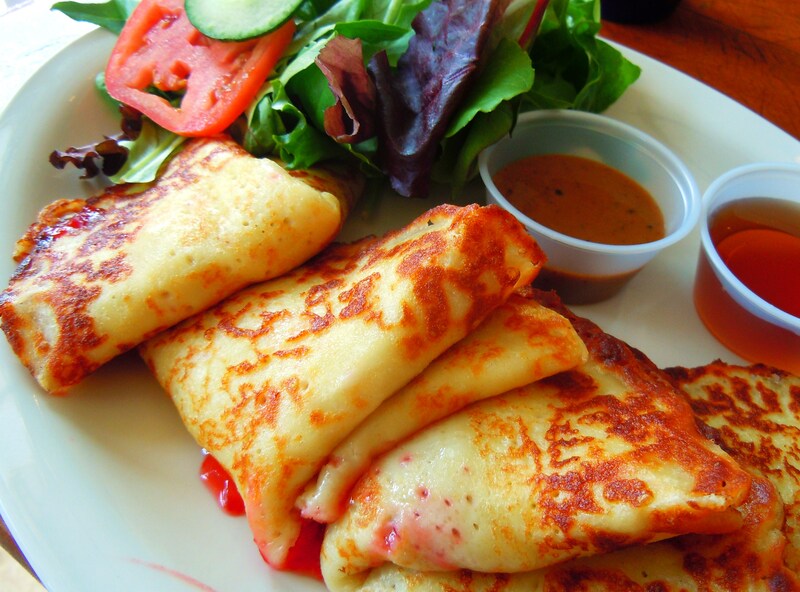 Futures Bakery has a mouth-watering breakfast menu (along with a hunger-inducing lunch and dinner menu), that boasts thick slabs of French toast and several different kinds of eggs benedict, omelettes, breakfast sandwiches, pancakes, and of course, crepes! Their spinach and feta omelette was the first breakfast dish I blogged about and I absolutely raved about their portions, their home fries, and everything in between. I made a solemn foodie promise to myself that I would eat my way through their menu, so this is my second breakfast post with much more to come in the future (no pun intended). 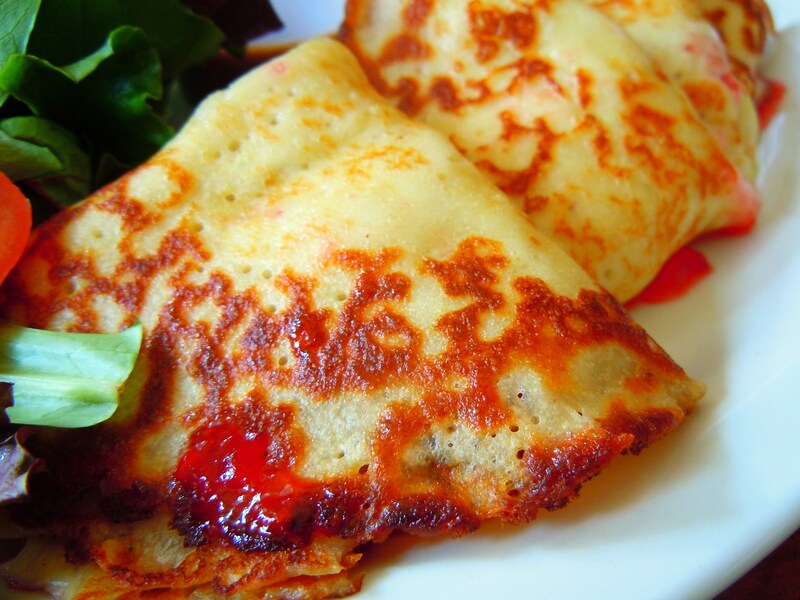 Futures serves 3 different kinds of crepes on their all-day breakfast menu ($6.95): strawberry, blueberry, and maple. And if you can believe, between myself, my mum, and my brother, we’ve eaten through all 3 kinds! And we love all of them. I love crepes, but I’m always a little wary about them. And what I mean by that is their potential to fill you and satisfy you as a full-fledged meal, without falling into the dessert category. I’ve had non-dessert crepes that tasted good, but that have sadly left me hungry and a little empty in the end. Off the top of my head, I know Demetres has GIANT dessert crepes (which prompted an old friend of mine to look at our non-crepe dessert plates and say, “why does mine look the most gluttonous? !”), and there are plenty of other places in the city I would love to go to that specialize in crepes, both savoury and sweet. I am to say though that Futures breakfast crepes are AH-MAZING. It was the combination of crepe and filling that makes the dish so good to eat. One doesn’t trump the other because both are equally as delicious and of stellar quality. 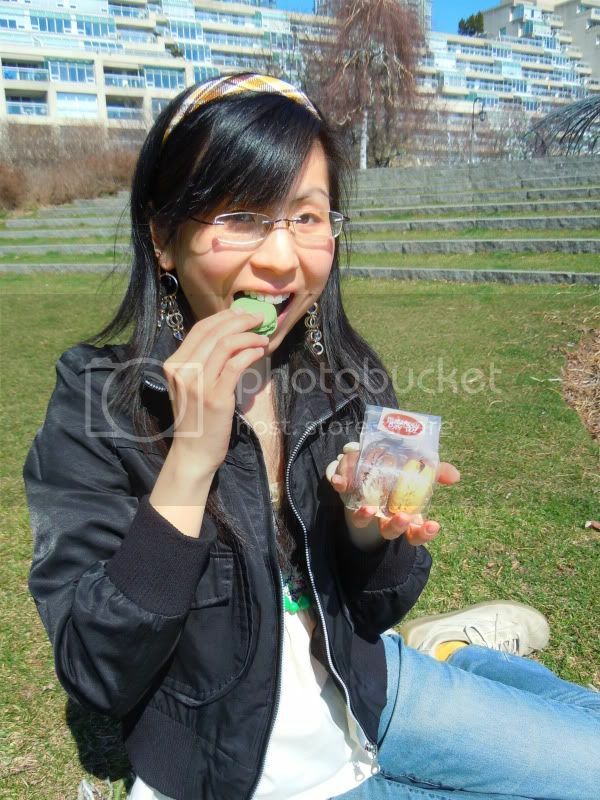 The filling is so fruity and sweet and fresh. You are not eating some lame filling that resembles jam out of a jar. You’re literally cutting into a thick, yummy crepe and watching the juicy strawberry puree ooze out and let me tell you, there’s a lot of it. As well, they’re not the paper thin kind that we’re accustomed to seeing. They’re thicker, like a pancake, but chewy instead of cakey. If I could make an accurate comparison of their appearance and texture to any other kind of food, I would say that they resemble blintzes. I say this time and time again, but Futures does not skimp and it’s great quality food at bang-for-your-buck prices and portions. 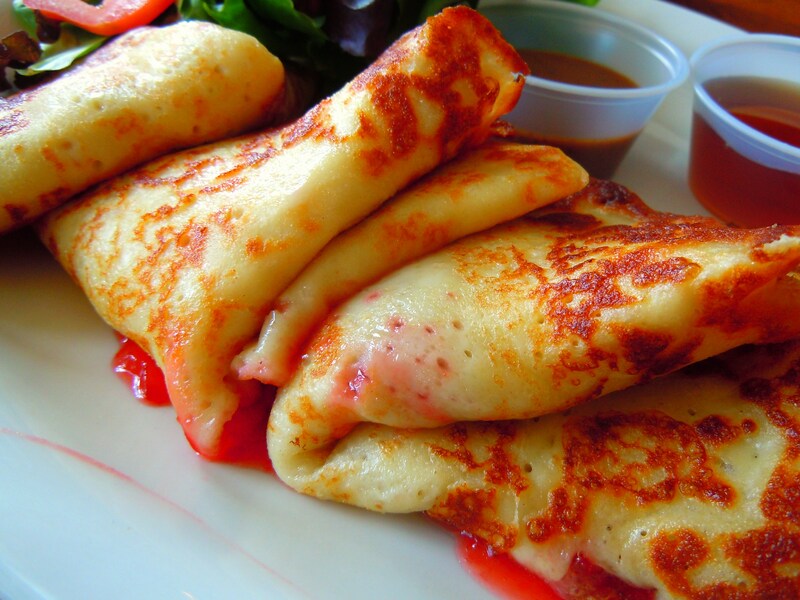 The crepes are plump, wonderfully crispy on the edges, golden in colour, and folded into cute little “envelopes” of strawberry fruit filling. This meal reminds me so much of summer mornings with baskets of fresh fruit, and why breakfast is so much fun to eat. The Vegetarian Sandwich Series – First Up: Futures Bakery and the Monsterous Grilled Vegetable Sandwich! I’m so excited to finally unveil this new series I’ve been working on – the vegetarian sandwich series! Entirely inspired by my friend Wini who is my vegetarian foodie partner in crime, I wanted to showcase some of the fantastic veggie eats around the city and places that are vegetarian, vegan, or just plain veggie-friendly with lots of healthy and delicious options. My vegetarian and vegan friends inspire me both in and outside the home kitchen. Between comfort food at home and eating out at fine dining establishments, diners, mom-and-pop shops, and greasy spoons, there’s a kind of reciprocity that occurs. The cooking and eating you do at home affects the choices you make when you’re out and about and conversely, what you eat when you’re out inspires you to take something away for future use at home. I find this to be especially true for me when it comes to vegetarian eating. I’m inspired by combinations, colours, and flavours both in and out of my home and I’m always eager to discuss new recipes I’ve tried out as well as excitedly bringing back home stories of tasty dishes. There have been times where I’ll see something on a menu and think, “huh, I didn’t think to put x, y, and z together in sandwich!” and I’ll end up being pleasantly surprised. It’s all about learning and experimenting and expanding our foodie horizons. So, first up for this vegetarian sandwich series is the amazing grilled vegetable sandwich at Future’s Bakery! Not only does Future’s Bakery serve out-of-this-world all-day breakfasts, they also serve fantastic mountain-high sandwiches worthy enough to fill you (and stuff you silly) for dinner! Futures seriously blows me away with their generous portions and wholesome delicious food. Their sandwiches are served on thick wedges of sundried tomato foccacia bread and are served with your choice of either two kinds of salad, or your choice of salad with a huge mound of yummy mashed potatoes with mushroom gravy. 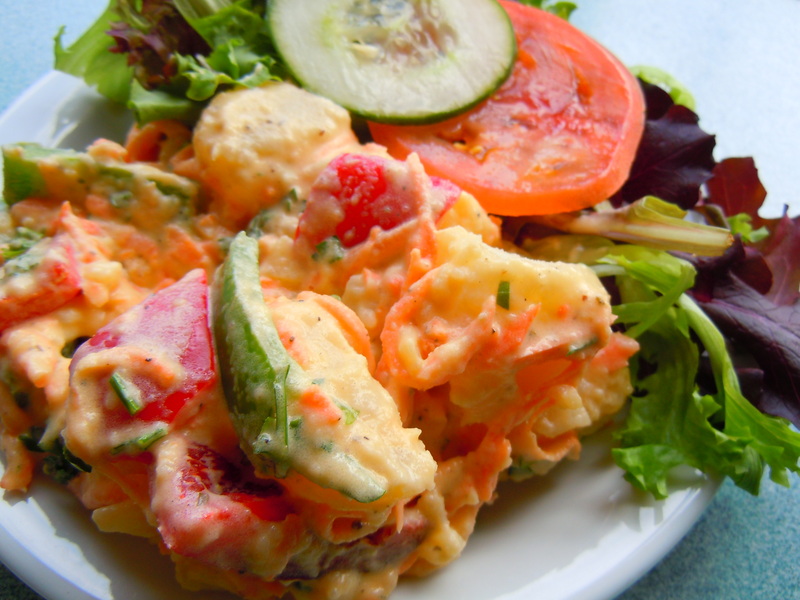 They normally have around five different kinds of salad to choose from including spring mix greens, potato salad, beets, mixed vegetables, and fruit salad. All their sandwich mains are priced between $6.49-$10.95 and yes, that’s including the salads and/or mashed potatoes! Lunch at Futures starts at 11am and all mains are available to order until closing. 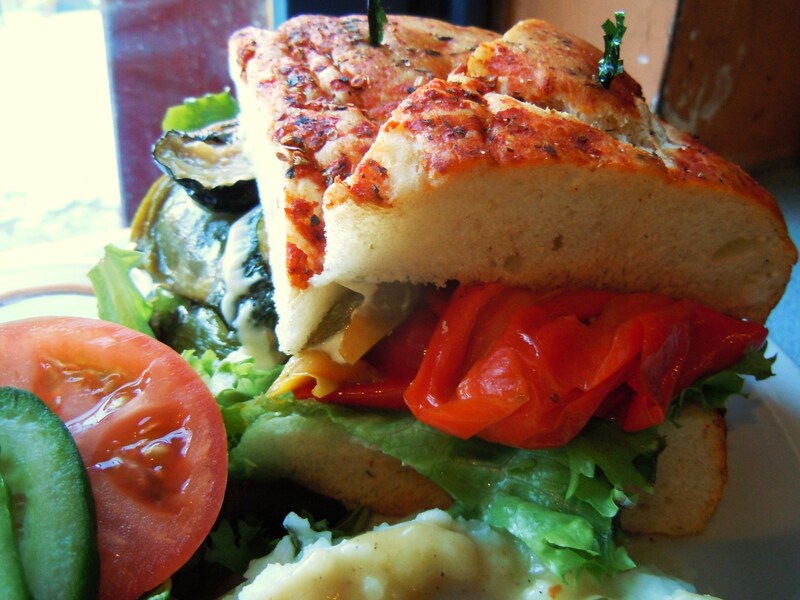 Their grilled vegetable sandwich is piled high with leafy lettuce, tomato, cucumber, roasted red peppers, grilled zucchini, and grilled bell peppers. This sandwich seriously lasted me through two meals and I really enjoyed it. The vegetables were juicy (and by that I just mean juicy in flavour, not juicy as in leaky!) and the bread was soft, flavourful, and so full of herbs. I’m a huuuge fan of places that utilize different types of bread outside the plain loaf of boring sliced white bread, so I definitely made a mental sticky note of their sundried tomato foccacia! Oh, and the mashed potatoes and gravy! Oh how I love how smart Futures is when it comes to their mashed potatoes. They make a well in the mashed potatoes on your plate for the mushroom gravy to sit in so the gravy doesn’t get all over your sandwich and messy. Genius! Now, don’t get the wrong idea and think that this grilled vegetable sandwich is just lip service on their menu for vegetarians; they have a number of vegetarian sandwiches on their menu which makes for plenty of options! They have eggplant sandwiches (breaded eggplant and eggplant parmesan), a simple cheese and veggie, and -get this- a PESTO, mozza, tomato sandwich! 😀 We all know how amazing pesto is. Sigh. I hope you guys have enjoyed this first installment of the veggie sandwich series, there’s plenty more where this came from and if any of you have suggestions, requests, or just discussion points pertaining to this, feel free to comment! This is going to be a really fun series to write about. 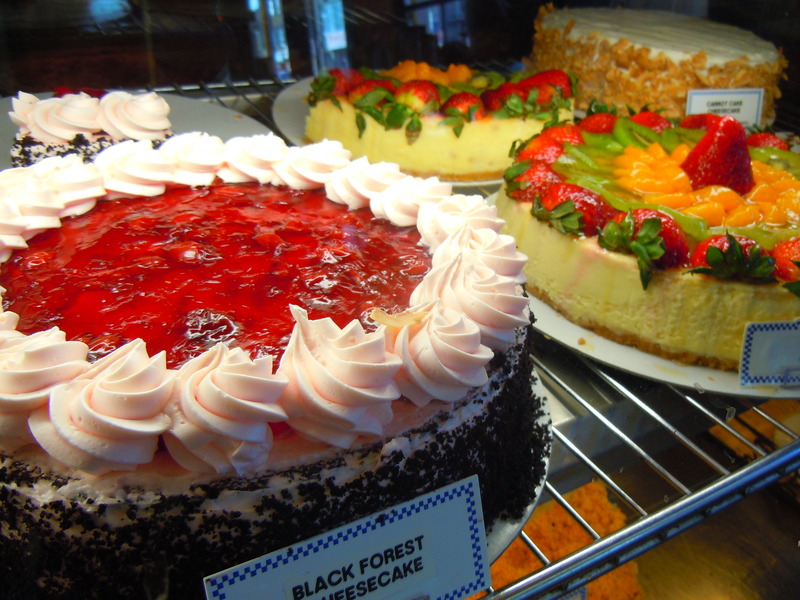 I’m so super excited to finally do a blog post featuring Futures Bakery. 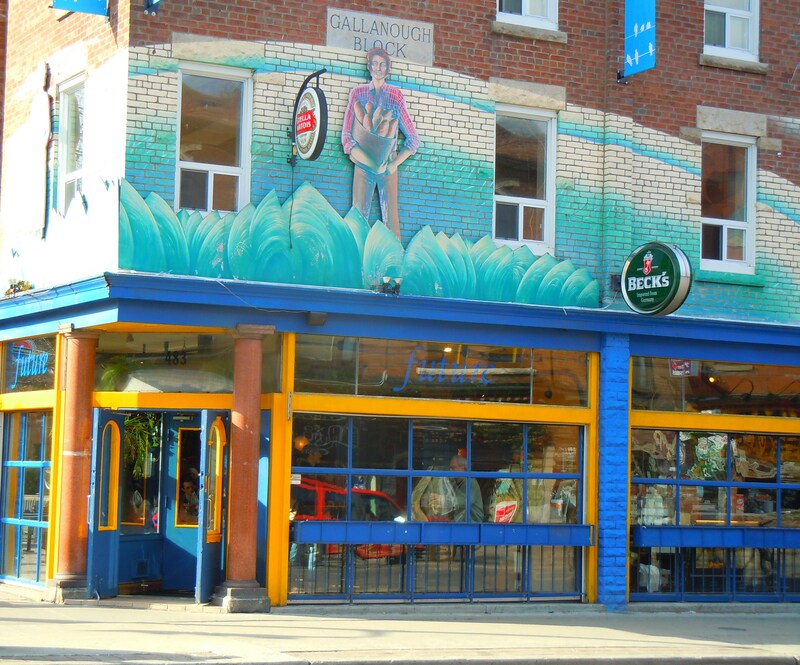 It’s one of my favourite places to eat in the city and it’s situated within a very well-known and well-loved neighbourhood in Toronto, The Annex. Sandwiched between Spadina Ave. and Bathurst St. on Bloor St. West, it’s surrounded by sushi bars, coffee shops, pubs, Thai and Indian restaurants, bookstores, and independent retailers with quirky, offbeat fashions, candy, stationery, and other trinkets. In other words, it occupies a fabulous location with a heck of a lot of foot traffic during the day! There’s plenty to explore and I’ve walked up and down this neighbourhood so many times for the past 3 years I’ve lost count. I’ve been here for breakfast, for lunch, with friends for brainstorming sessions for school, with my boyfriend for a midday meal, and most recently, with my mum and my brother for breakfast, and each time has been fun and has provided me with such a sense of comfort. Futures Bakery, to me, is a jack of all trades. 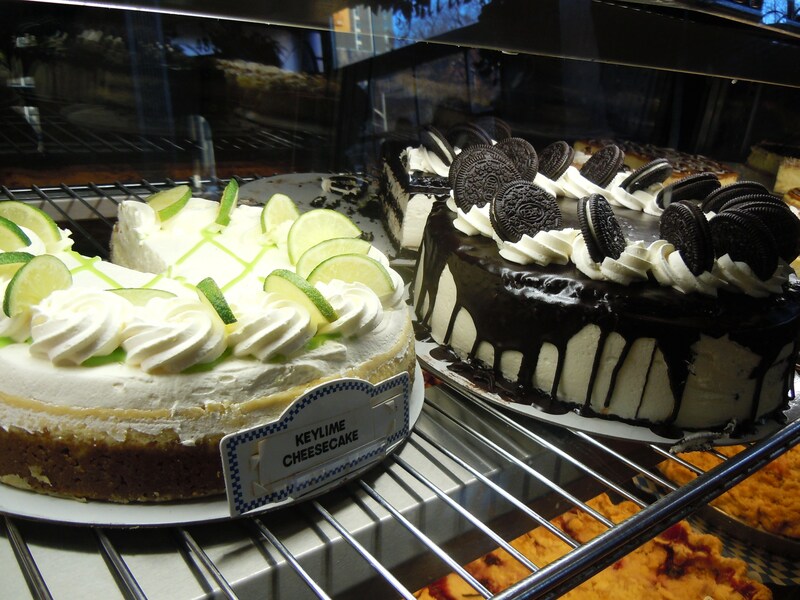 The cake selection in the bakery would make anybody’s jaw hit the floor (and then, you know, drool out puddles) with their offerings of key lime cheesecake, Oreo cheesecake, tiramisu cake, black forest cheesecake, and carrot cake cheesecake just to name a bunch. 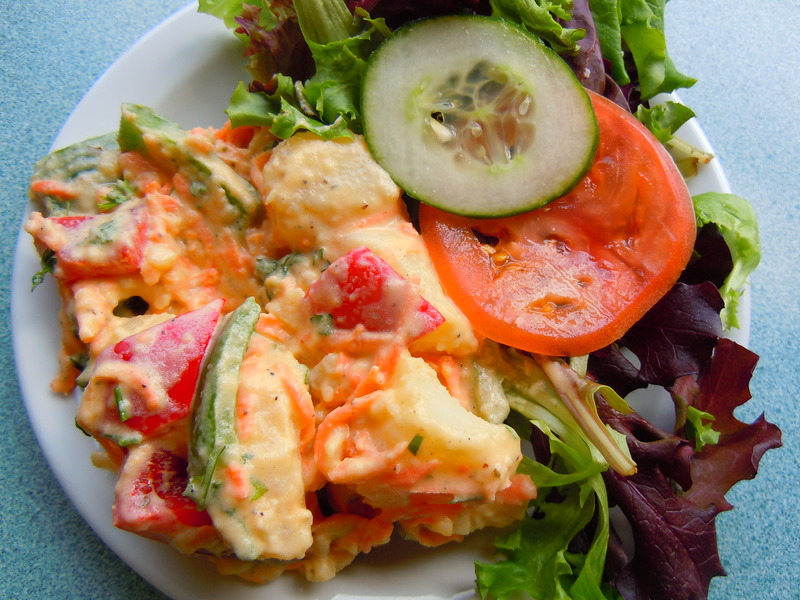 And their all-day breakfast and lunch/dinner menu offers plenty of delicious eats! Their breakfast menu includes both sweet and savoury meals such as strawberry, blueberry, and maple crepes, French toast, omelettes, pancakes, eggs benedict, eggs florentine, grilled cheese, and others, served with sides such as toast, fruit salad, and potato wedge home fries. Their lunch and dinner entrees are just amazing. Not only do they offer all-you-cat-eat pierogies night every Wednesday from 5-9pm (the pierogi lover in me squeals like teenybopper at this) but they also have a menu dedicated to ridiculously large sandwiches and comfort food such as cabbage rolls, lasagna, chicken and pork schnitzel, chili, and a selection of soup and salads. 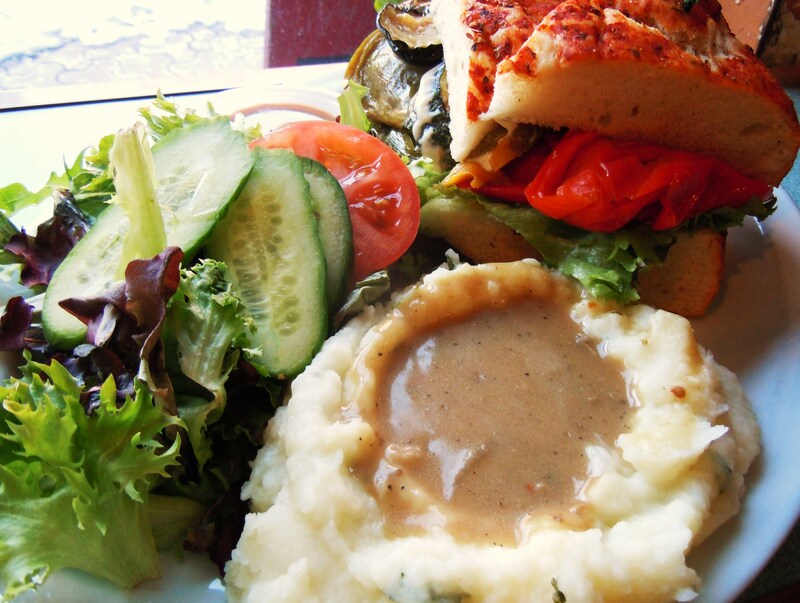 Entrees come with either a choice of 2 salads, or a choice of salad and mashed potatoes and mushroom gravy. I’ve eaten here a handful of times, but I’m going to start by showcasing their breakfast for this blog post first. I brought my mum and brother to Futures Bakery for breakfast last week for the first time and they both LOVED it and that made me so happy. And not just because everything tasted delicious, but for other reasons which I’ll get to a bit later in the post. I adore breakfast food. I am totally amoured by my vision of the perfect meal: great food, great company, and beautiful sunshine and a light breeze streaming through the windows. Basically, a meal of relaxation, peacefulness, and absolute bliss. I ordered the spinach and feta cheese omelette and I was so happy with my food. 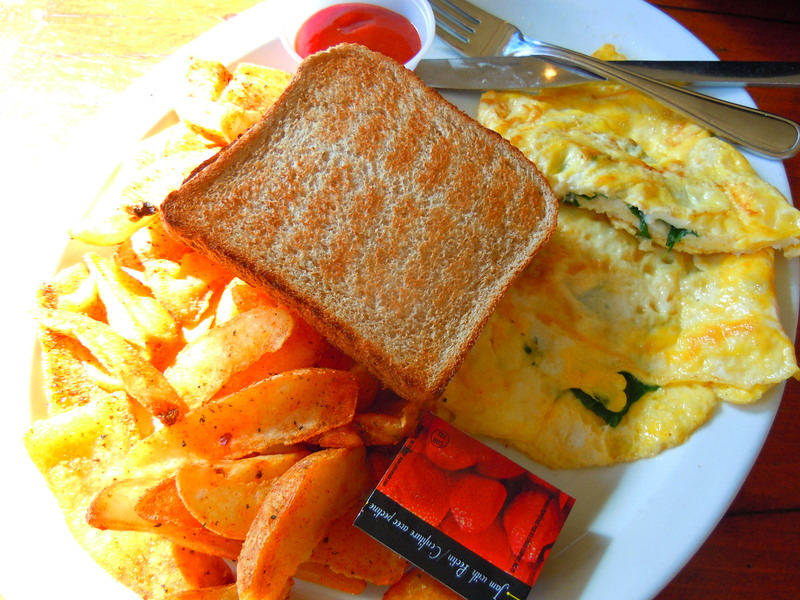 A large omelette (I’m positive they must have used 3 eggs for this) chock full of fresh spinach leaves and savoury feta, served with a helping of potato wedge home fries and ketchup, and whole wheat toast with jam and butter. 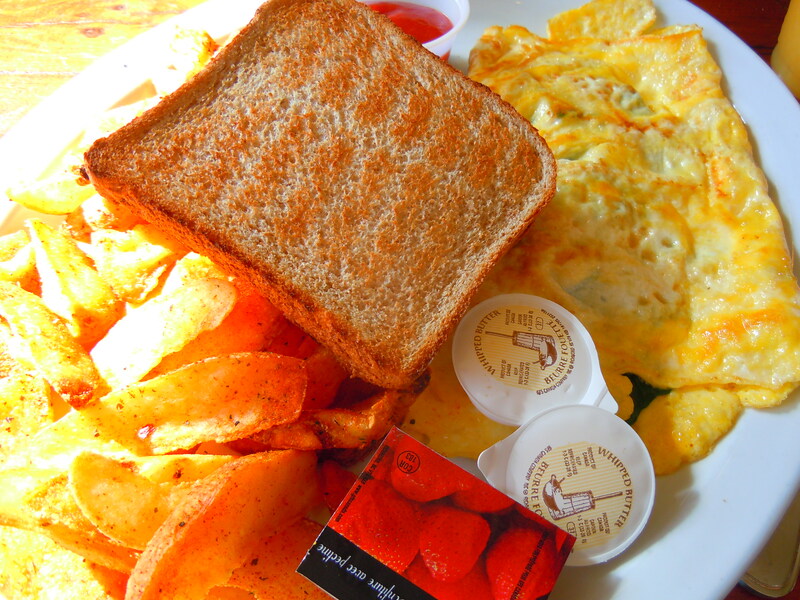 I loved my omelette and home fries for so many reasons. My omelette let the feta do the talking. In other words, it wasn’t salty or oily or overcooked. 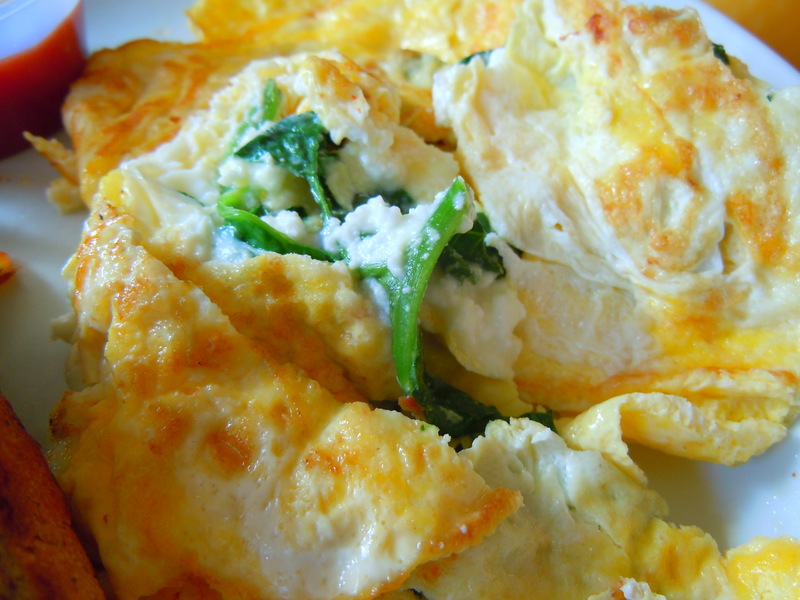 The feta was allowed to shine with its creamy saltiness without being overwhelmed by the eggs or the spinach and I was able to appreciate all three without having the flavour muddied up together. 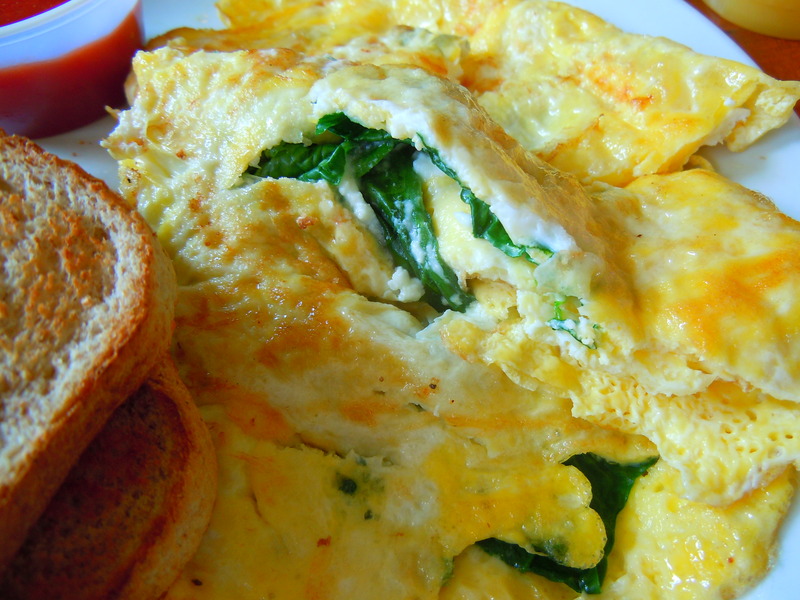 And the awesome thing about the spinach was that there were fresh leaves of it in my omelette. It didn’t taste like it had been sitting in a packet in the freezer the whole time and really, you can tell. Frozen spinach does not come in leaves! 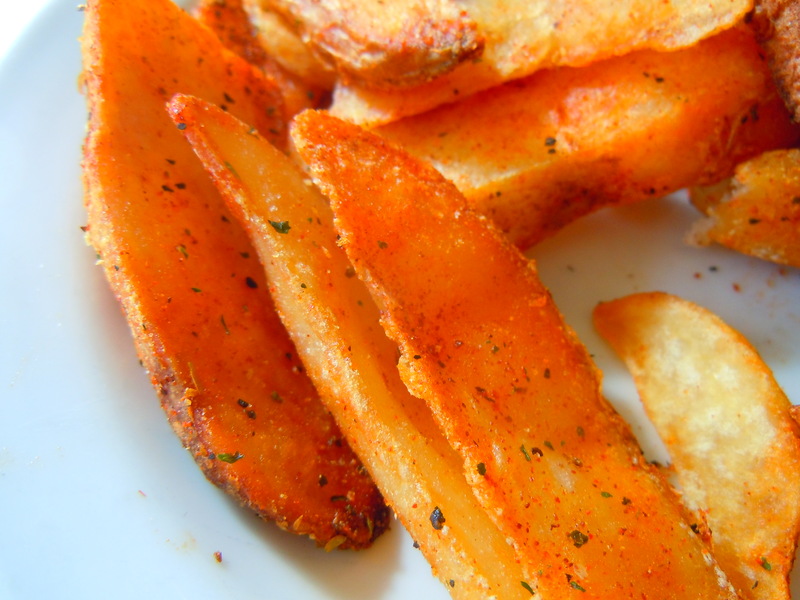 The potato wedge home fries definitely deserve lots of “yays!” because they’re soft, not too starchy (I hate the potato wedges that come out so starchy they make your mouth feel parched and then make you want to gag), and I LOVE how they’re seasoned! They taste like all dressed Ruffles chips! And here’s why I love Futures Bakery so much. Of course I love it here because I have enjoyed everything I’ve eaten, but it’s more than that. Their prices are SO freakin’ awesome (breakfast and entrees for under $10) and their portions of food say this: we want you to eat. That’s not to say they give you a buffet on a plate and want to give you a heart attack (read: super size syndrome), but you can tell from the food on your plate that they take the care, the time, and the love to give you good food. They give you bang for your buck and they want you to leave feeling full and satisfied. People can say that their biggest turn-off with a place is the atmosphere, the service, the menu choices, etc. My biggest turn-off is when I can SEE, from my plate, that the establishment is nickeling and dime-ing me. There is no bigger turn-off. I can’t tell you how much it warms my heart whenever I get a plate of food from here because it embodies the comfort and love of food, and the people who work here have been so nice and welcoming each time. And it’s because of all these things that I will continue to come back, time and time again.